You can adjust Kanji Go's Language and Interface to optimize your studies. The majority of these settings are found within Preferences. Enabling Romaji: In addition to viewing content using Hiragana and Katakana, you can also view it in a Romanized format.To Toggle Romaji Display on/off, Select 'Use Romaji' (cmd r) from the View menu. Changing the Font: You can quickly change the font size from the View menu (Bigger Font, cmd +, and Small Font, cmd -). Additionally, you can change the font used to show Search Results, Vocab Lists, and Digital Flash Cards. Click Apply- if you have the font installed, it will be applied instantly. If not, the default font will be used instead. 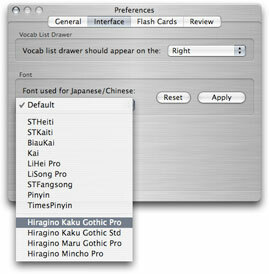 Note: The Default font will vary based on your version of OS X- the appearance of some Kanji will vary with font, so you may want to explicitly set the font to 'Hiragino Kaku Gothic Pro' - the default under versions of OS X prior to 10.5. Changing the Language: You can change the language that search results are shown in from Preferences. The dictionaries for each language vary in size, so not all words in one dictionary are available in others. The Japanese-English, Deutsch, and Chinese-English dictionaries are the most comprehensive.